The Comets looked to bounce back following a crushing defeat in the district championship on Saturday. They did just that on Tuesday night. Despite a late arrival by the Maidens, the Comets picked up a 2-0 win to advance to a quarterfinal match-up against defending state champions, Emmaus on Saturday. The McCoy twins powered the lady Comets to the victory. Emily McCoy scored the first goal less than seven minutes into the game. Her twin sister, Eryn McCoy drove in the second goal for the Comets. “We played a good first half,” said Comets coach, Matt Soto in a tone that he expected more out of his girls but was satisfied with the victory. His tone was less than satisfying on Saturday after the Comets could not handle the Falcons in the district three Championship game in Hershey. 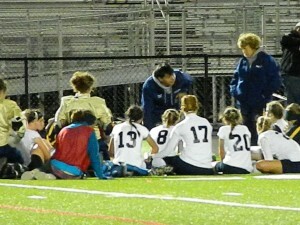 The Comets lost a one nothing heart-breaker to Lower Dauphin to claim second place in districts. Soto reiterated after both games that they have a lot to work to do between games. Well they seemed to have figured it out before their state game. Well see on Saturday at noon at Exeter High School if they made enough changes to get redemption on Emmaus.